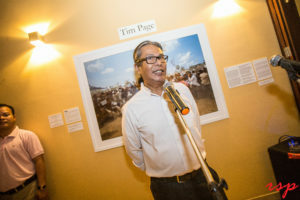 The RESILIENCE Exhibition opened in Phnom Penh on December 15 to a great mixed crowd of dignitaries, universities and students, peacebuilders, and the arts community. Looking for a creative way to commemorate the 25th Anniversary of the Paris Peace Accords, RESILIENCE explores the way that Cambodia has overcome decades of war. 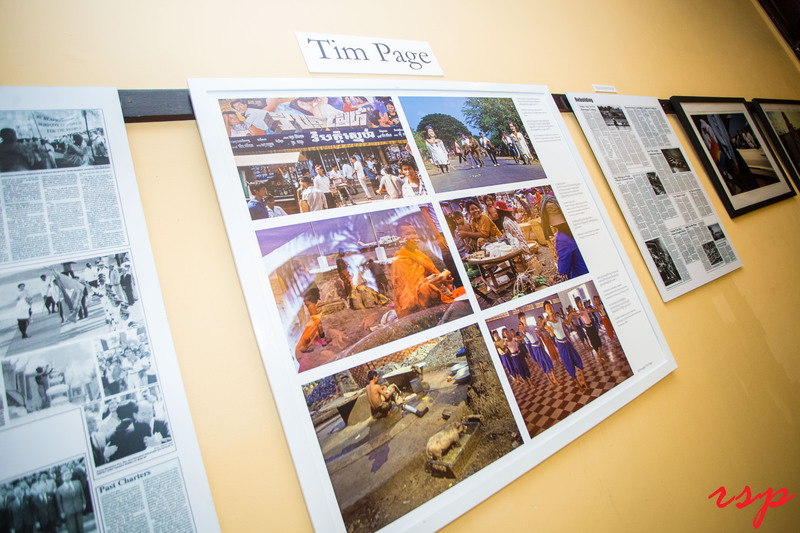 Beginning with the work of Tim Page, photographs document the challenges and successes of the repatriation of refugees, of rebuilding the physical spaces of the country, and the elections in 1993. Continuing onward John Rodsted’s work focuses on the challenges posed by landmines by highlighting the resilience of landmine accident survivors and landmine clearance. Finally, George Nickels’ work demonstrates the on-going and evolving efforts to recover from war. Hosted by the Foreign Correspondence Club, opening was attended by great mixed crowd of dignitaries, universities and students, peacebuilders, and the arts community, and was a space for reflecting on the incredible resilience that is witnessed all the time in Cambodia. 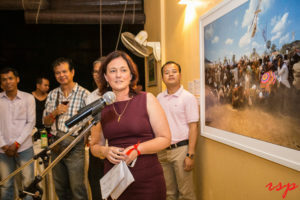 The Australian Ambassador, Angela Corcoran, who herself first served in Cambodia in 1994 with the United Nations Development Program. Reflecting on Australia’s friendship with Cambodia, Angela Corcoran also shared her own memories of seeing children injured by landmines and having to take cover from shelling in Siem Reap. Soth Plai Ngarm, CPCS co-founder and the visionary for the Peace Museum, shared his personal journey through the conflicts, his time as a soldier, and his decision to invest his life in peace. Questioning the violence he has seen in his life, he asked: “How can we prevent something like that from happening? I cannot find the answer for everything, but the place that I find myself satisfied is education. If we learn from the past, we will not repeat the same mistake.” Ngarm added “We can tell the stories when we fall down, or we can tell the stories when we stand up”. RESILIENCE tells the story of, how Cambodia stood up and how Cambodia continues to stand. The Centre for Peace and Conflict Studies extends our deepest thanks to Sasha Constable and the CONSTABLE Gallery At Large team for their vision and hard work to make this exhibition possible. RESILIENCE is sponsored by the Australian Embassy in Phnom Penh and the Foreign Correspondence Club of Phnom Penh.